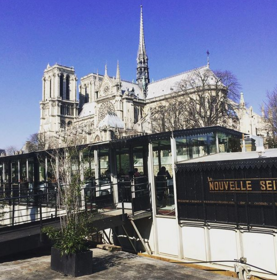 So you want to see the Eiffel Tower and Notre Dame unlike most people? To get to the Eiffel Tower, one way is to take the Metro and get off at Champ de Mars - Tour Eiffel. Now, most people when they get out of the station will travel on Quai de Grenelle until well, you can't miss the Eiffel Tower. For a bit of a pop of surprise mixed with local flair, once you get out of the Champ de Mars station, take the first street on the right (Avenue de Suffren), then turn onto the first street on the left (Rue de Buenos Ayres). Enjoy the view! Or you can see this beauty in all its glory sitting across the river where Paris started some 2300 years ago. Imagine how a little village on a tiny island became one of the most magical cities in the world. What are your best views of Paris? Share in comments below or drop me a line!